Everyone concerned about corporate education reform and the influence of various venture �philanthropists� in their drive to privatize public schools should be following the Democratic primary on May 19th for the next mayor of Philadelphia. Neoliberal and conservative financiers, in a drive to make Philadelphia public schools like the New Orleans school system, are investing millions of dollars in the mayoral race. 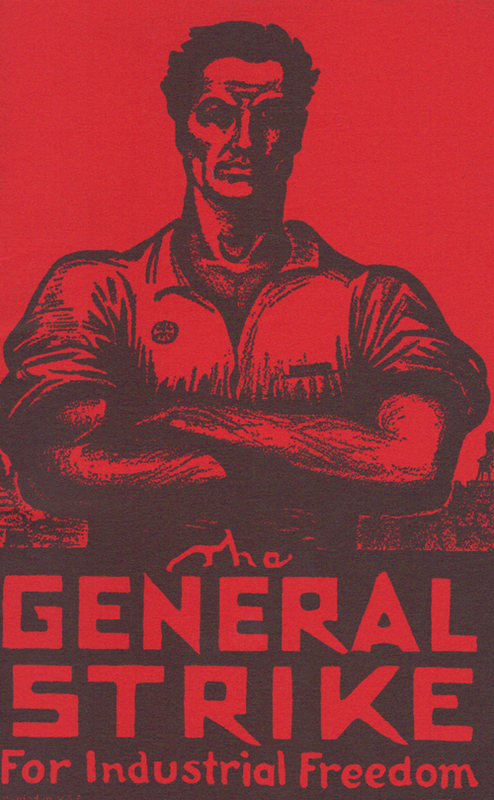 Classic poster for the General Strike from the Industrial Workers of the World (IWW)...Most prominent is the Susquehanna Investment Group (SIG) that is funding state Senator Anthony Williams. SIG made an initial investment of $250,000 for television ads at the beginning of his campaign. In the final weeks of the campaign, they have boosted their funding to $800,000 per week. The other major contender in the Philadelphia mayoral election is Democratic City Councilman James Kenney. Kenney has no problem with the expansion of charters as long as the state reimburses for their cost. Williams backers, beside the outside financial interests investing millions in the Williams campaign, include Black Clergy of Philadelphia and Vicinity, and union leadership of sheet metal workers, laborers, operating engineers, and transit workers. Kenney has been endorsed by much of the Democratic Party machine in Philadelphia, the Philadelphia local AFL-CIO leadership, including the Philadelphia Federation of Teachers and a carpenters union, State Representative Dwight Evans and a coalition of African American leaders. The splintering of Philadelphia�s labor movement is in marked contrast to 1973, when the PFT was on strike for 7 � weeks, the top union leadership was jailed for contempt of court without bail, but the strike ended with a victory for the teachers as the city labor movement was preparing a general strike in support of the teachers. On May 3rd, Williams was endorsed by the Editorial Board of the Philadelphia Inquirer. They said the deciding factor was Kenney�s union support. Critics of the endorsement pointed out that the Inquirer is owned by Gerry Lenfest who is strongly pro-charter, a supporter of Teach for America, and corporate education reform as a whole. Reports are that the endorsement caused a lot of dissension on the staff at the Inquirer. Asked if she was concerned, Williams campaign spokeswomen Barbara Grant said in a statement �that Kenney and his allies will learn that both the Inquirer editorial board and voters don't think that Kenney's union supporters "need a seat in the mayor's office." Both State Senator Williams and State Representative Evans support the Education Improvement Tax Credit Program. This program is a form of voucher that gives businesses a tax credit for providing scholarships for students to attend private or parochial schools in lieu of paying state taxes that would be going to public schools. This method of circumventing the Pennsylvania Constitutional mandate which says government cannot fund sectarian schools was pioneered by Florida Governor Jeb Bush after vouchers were declared unconstitutional by the Florida Supreme Court. Funding for Florida's Corporate Income Tax Credit Scholarships program has risen dramatically since its inceptions. On February 5, 2015, Fuller participated on a panel at the right-wing American Enterprise Institute during which he said, "We (BAEO) wouldn't exist without John Walton and this is one of the reasons I love that man." Fuller seems indifferent to the fact that the money given to BAEO by the Walton Foundation comes from the low-wage exploitation of Walmart workers! Like Williams, Evans has tried to start charters schools while he voted on education legislation as a Philadelphia Representative in Harrisburg. In 2011 he came into conflict with Broad Foundation board member Philadelphia Superintendent Arlene Ackerman over which charter company should take ownership of Martin Luther King High School. The clash led to a chain of events that lead to Ackerman�s resignation as Superintendent. Early this year a pro-charter, anti-public school political organization descended on Philadelphia. Philly School Choice has appeared to counter-protest rallies of the Philadelphia Federation of Teachers and to organize parents with children in charter schools to speak at SRC meetings in support of charter expansion. It does not reveal its funding sources, but it�s leader, Bob Bowden, is will known in right-wing libertarian, corporate privatization circles. The National Urban League has received $5,286,017 from Gates over the last few years. Put other organizations, like BAEO, NAACP, AFT, etc., in the search window to see what they have received from the Gates Foundation. The infusion of corporate and hedge fund money into all levels of government for the purpose of privatizing public education is a grave danger to democratic rights in the United States. Recently twenty-five civil rights groups joined Arne Duncan and endorsed the continuation of standardized testing in the reauthorization of the Elementary and Secondary Act (ESEA). This is a direct response to the burgeoning Opt Out movement where parents are saying they do not want their children to be used in the national social experiment being undertaken by corporate education reform. We are fighting for a reset to get rid of high stakes. The civil rights community and the President of the United States of America is fighting very hard to have annual tests for one purpose. They have seen in states for years that if they didn�t have them that states would ignore children. They agree with us now that they have been misused, but they fought very hard in the last few months to actually have annual tests as opposed to grade span (in ESEA). She then went on to attack Arne Duncan as if there is not connection between Obama and Duncan. A few days after the NPE conference, Weingarten spoke in support of Common Core at an event sponsored by supporters of Common Core. It is not necessary to torture children with standardized testing in order to see if a school needs funding. All you need to do is look at the income level of families in a school and you will know what funding is needed to meet the needs of students at that school. In addition to testing company profits, standardized testing is used by corporate education reformers to decide which public schoolsshould be �turned around� to charters to advance a privatization agenda. Based on the experience of the oppressive conditions in many urban areas, the explosion in Baltimore against police repression to those fighting the oppression is causing many youth to reject the social and political forms that have been holding them down. The fragmentation of the Democratic Party in Philadelphia is a harbinger of great changes coming nationally. Nature abhors a vacuum. A political party with a program that meets the needs of the 99% needs to be built out of the struggles on which the youth have embarked so we do not descend into a social disaster. Divide and Conquer: The Philadelphia Story | Defend Public Education! Once again, it�s not a drive to privatize � that would mean converting public schools into private schools. It�s a drive to monetize public schools while keeping the taxpayer cashflow flowing � flowing like an open artery without a tourniquet. Without the infusion of public dollars it�s not really worth their investment, or else they could simply invest in bona fide private schools. It�s not privatization, it�s piratization. To say the issue is to "monetize" the public schools is to say that simple greed is behind the attack on public schools. This attack has deeper roots and is decades old. In 1981, the threat of a general strike by the Philadelphia labor movement ended a 50-day-strike by the Philadelphia Federation of Teachers after the District attempted to lay off 3,500 employees and cancel the teachers' contract.